Cowlitz PUD requested a second opinion from Ecological Land Services, Inc. (ELS) regarding an area of concern near one of their reservoirs. 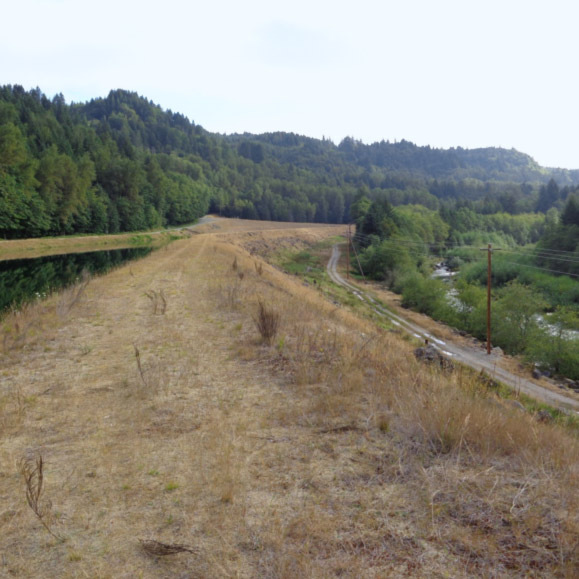 ELS biologists and ecologists investigated potential wetlands between the lower levee access road and Swift Canal east of Forest Road 90 in Skamania County, Washington. ELS staff took data plots and photographs to document site conditions and consulted engineer drawings from the original construction of the levee. Because all the test plots within the area of investigation showed compacted sand and gravel in the soil profile, it was apparent to ELS staff that the area was within the constructed levee. ELS found that the levee was previously permitted for construction by a federal agency (FERC) and was a serviceable, regularly maintained structure; therefore, ELS established that the ongoing work and proposed repairs were allowed activities which fall under the Nationwide Permit 3. The Army Corps of Engineers agreed with this finding, significantly reducing the cost and energy required by Cowlitz PUD to complete their work.